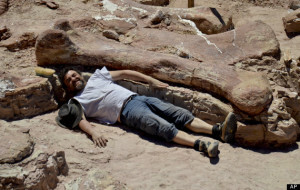 Scientists believe they may have found the world’s largest dinosaur remains. The researchers, who are from Museo Paleontologico Egidio Feruglio in Argentina, have unveiled their discovery of seven dinosaurs’ remains earlier this week. They have released photos of the sites that contain substantially sized fossils. These fossilized bones show off the massive size of these animals. 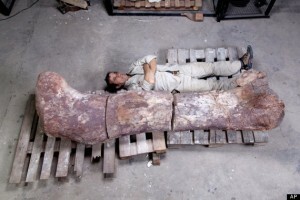 The specimen has been dubbed Titanosaurs and is a part of a district group of sauropod dinosaurs that are characterized by their huge demeanor and very long necks. Scientists believe that this species lived about 95 million years ago which was during the Mesozoic Era. The scientists have found many different parts of the dinosaur including the neck, back, tail and legs. 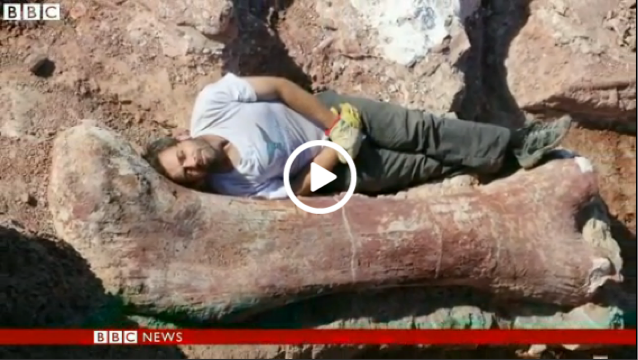 In one of the pictures you can see people laying down next to the femur bone of one of these huge Titanosaurs’. So far based on the remains, the dinosaur is estimated at about 40 meters (131 feet) from head to tail and about 20 meters (65 feet) tall. They also believe that one of these could weigh up to 77 metric tons which is a staggering 170,000 pounds. The mass of fossils was found near a graveyard of carnivore teeth. This means that the predators may have tried preying on the giant herbivores’ remains, but struggles to pierce their thick sink. Resulting in them loosing teeth in the process. Only about one-fifth of the area has been explored so far. There’s no telling what else the researchers may find. He Made Caramel Out Of What? YUMMMM! !